"ማሳሰቢያ: የዚህ ፊርማ ማሰባሰቢያ ዓላማው አባቶችን መማጸን ብቻ ነው:: ከገንዘብ ጋራ የተያያዘ ምንም ነገር የለውም::"
ሁለት ብር የሚጎዳ ነገር የለውም፡፡ ችግሩ የተማጽኖ ፊርማው ከገንዘብ ጋር እንደማይያያዝ በስተመጨረሻ የተገለጸው ግን ከቀጣዩ ገጽ ጋር የማይዛመድ ነው፡፡ ለመሆኑ ድረገጹ የማን ነው? Answer to Mahbere Christian. They are asking for donation. No body asked any one to pay. But the organization who set up the online petition is non profit and asking people to donate so that they can do more. But you can chose not to donate. It do not affect your petition. If you read carefully at the beginning it says 'your petition or signature is recorded' That means it is accepted with out paying. But if you want to support the non profit online organization they are asking for donation. Please do not pay if you do not want to. It will not affect your petition. ውድ ደጀ ሰላም፤ ምነው ምን ነካችሁ? የጥቅምቱ ሱባኤና ጸሎታችን አልሰራም ነው የምትሉን? ምነው ዛሬ እንደ ፖለቲካ ፓርቲ የፒትሽን ፊርማ የምናሰባስበው ለምንድን ነው? አባቶቻችን ምልክት የሚፈልጉት ከእግዚአብሔር ነው እንጂ ከሰው አይደለም። መንፈስ ቅዱስን በአካል ቅዱስ መተካት አይሆንብንምን? "Please choose the amount of your donation below: $2, $5, . . . "
That is what I first thought to but once you put your name, e mail and comment (if you have any), and "submit" it goes automatically to the donation page. Your petition is already signed so DO NOT WORRY ABOUT it. You do NOT have to donate to sign and the donation is not for the commetee, its to the website that lets you do the petition. Genzeb yemiteyikewun "ignore" madireg new! 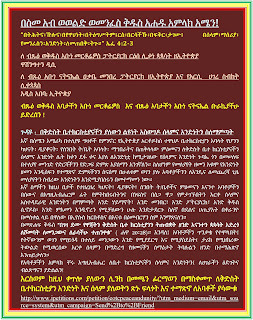 Please please please...For the sake of our beloved Fathers who fought against any foreign and domestic enemies to protect our one and only one Tewahedo Haimanot, we want ONLY ONE ETHIOPIAN ORTHODOX TEWAHEDO HAIMANOT. As I read, listen, and watch...our history is going in the wrong direction. Priests are not faithful for their children, churches are focusing on formation of buildings rather than community, our Cardinal’s faith is degrading and weakens due to political pressure. Our people are losing trust on our Cardinal, spiritual leaders, spiritual singers, song writers and above all, our children are raising without spiritual father b/c of lack of trust and commitment to the church and lack of good leadership. This is the time to make everything right. This is the time that can make or break our great History. This is the time to pass strong faith to generations. 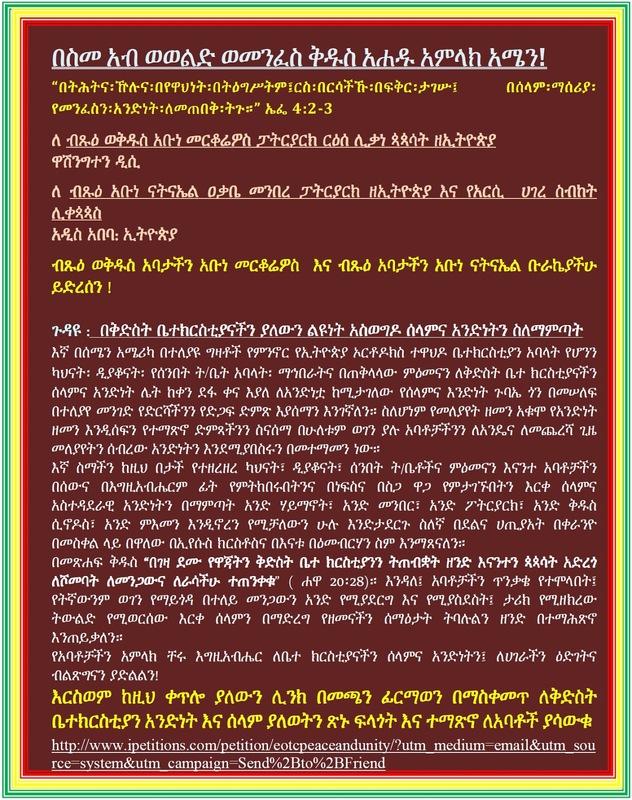 This is the time to make Ethiopia The Greatest Christian Nation as it was in the past. Please, all Cardinals (fathers), please be open to the Christian nation and be upfront, stop being scared b/c the government is (may be) trying to torch or harass you at any cost. This is what all of you signed for in front of God.